At the Trumbull Burying Ground, I found another interesting item: the Ephraim Terry stone (1797). The most obvious anomaly here is the style, which is anachronistic for the 1790s. 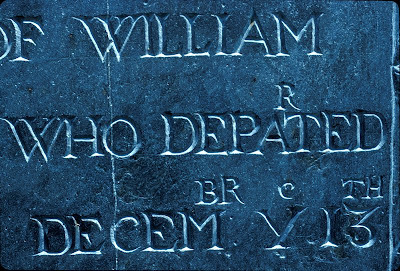 By that time, gravestones in Providence, Marblehead, and other well-connected places were moving toward lightly-inscribed urn-and-willow designs. In contrast, the Ephraim Terry stone has a deeply-carved, sensuous design and a curvy outline, indicating that it derives from older styles. This isn't surprising because Lebanon was (and is) a small, rural hamlet, not an urban center, so the aesthetic sense may have been a bit provincial. The style of the face and pointy wings indicate that this stone was carved by a member of the Manning family, possibly one of Josiah Manning's sons, Rockwell or Frederick, or a member of his workshop. For more info on the Mannings, see Allan I. Ludwig's Graven Images: New England Stonecarving and its Symbols, 1650-1815, page 409. Just try saying "depated" with a short a and presto, you sound like you're from Fall River. The fact that more than one carver made the same mistake indicates that the southern New England accent was light on the "r"s, even in the eighteenth century. There's another stone in Lebanon that says that someone died in "Novemba," but I wasn't able to find it on this trip - I'll look again next time. If these gravestones are any evidence, the colonial New England accent is best preserved by modern residents of southeastern Massachusetts/northern Rhode Island. One last interesting thing: if the carvings preserve a pronunciation, it probably means that the carvers may have been literate enough to write phonetically, and someone was literate enough to catch a spelling error. I found another one! This example is from the Brooklyn, Connecticut cemetery next to the fair grounds. Jane Tyler "Depated" this life in 1741.